Being seen in the dark can be easy if you know what kind of lights to use to safely navigate through pitch-black areas. If for whatever reason you need to shut off your headlights, grille marker lights can be lit up to mark your location. Neil decided he doesn’t need the utility but does think they look pretty cool, and that’s reason enough to get Raptor style amber LED grille lights! Our grille marker LED light kit includes three removable 3D projectors that shine in 2500K amber yellow, mounted on a steel bracket to evenly space out the LED lights. The installation is a straightforward process of removing your Ford’s front grille, finding your mounting locations to secure the grille LEDs, and connecting the wires to your headlight (+/-). Some grilles may position your grille light brackets offset, so may any necessary adjustments to get the look you want. Regardless, Neil was able to achieve the Raptor style lighting for his truck’s front grille while boosting the formidable appearance of his F-150 XLT. Thanks for supporting us! You can find this and more easy install truck LED lights and accessories at iJDMTOY.com today. 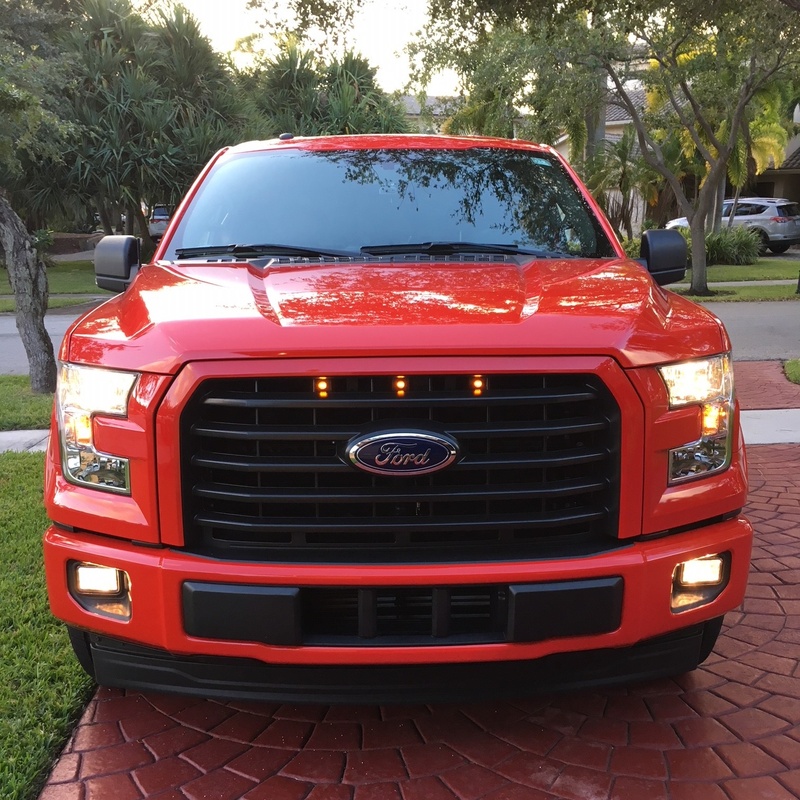 This entry was posted in - LED & HID Updates, - Tech Support & DIY Guide, Ford and tagged 2017, 2500k, 3D projectors, amber yellow, brackets, F150, ford, grill lights, grille marker lights, LED, Raptor, sport, truck accessories, Trucks, XLT by Jason T. Bookmark the permalink.